There was an odd extra-terrestrial kerfuffle in the mainstream media this week, after claims emerged that the United Nations was set to announce the appointment of an ambassador with responsibility for dealing with alien contact. This caused a rather large outbreak of UFO mania, with bookmakers using it as an excuse to take bets on the imminent arrival of aliens. If the UN's gearing up for an alien encounter, then surely that means there's something big showing up on the long-range scans? Sadly, it turned out to be not quite the case. The UN called the idea "nonsense" and said that Mazlan Othman, who heads-up the UN's amazingly exciting-sounding Office for Outer Space Affairs and was the supposed alien ambassador, will instead be talking about space junk and asteroids in conferences for the foreseeable future..
We've been enjoying Minecraft quite a lot recently. Not playing it, but watching videos of people having fun in its incredibly versatile world - by building models of starships and playing about with fire and all the hilarious consequences that unfold. But this latest video beats the rest by a mile. A guy's made a fully functional 16-bit processor unit within the game. It's the size of a city. And made out of grass and stone textures. And works. "Coat and sandals, nothing else"
If you're so devoid of free, original thought that you like the idea of having an app tell you what to wear tomorrow, there's... an app to tell you what to wear tomorrow. Wearcast hooks into the local five-day weather forecast, giving you tips on if you should bravely risk just a jumper tomorrow, or if you should go the whole hog and wear your coat. 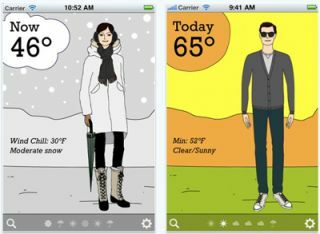 REMEMBER CLEAN PANTS: "And do up your flies"
Apparently powered by a "proprietary meteorologist-developed algorithm" the app uses temperature and wind chill ratings to pick between suggested outfits. The comments beneath the iTunes listing are depressingly positive, with people claiming it's actually helped them pick clothes for the day. There is no future.